Ehiz Blog: Of Calamity Crow and tempers. Of Calamity Crow and tempers. If you are forced to watch kids channels, I am sure you must be familiar with JimJam. 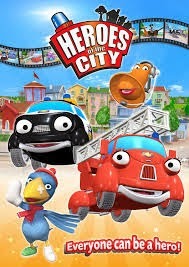 There is a program called Heroes of the City, where the lamppost, the fire truck and the police car all race to save the city from fires and any disaster; and sometimes from the silly and clumsy bird called Calamity Crow. Now, Calamity Crow is a sweetheart, always singing to himself as he skips along the road (yadiyadiya, yadiyadidoo), but you know he is going to destroy something, or get himself entangled in some calamity like setting his house on fire as he tries to cook. The list is endless. Despite that, he has such a sunny disposition and is always trying to help. In one episode, Calamity Crow overheard the city's baker complaining about a late delivery of flour, meaning no bread for the town for that day. The baker also muttered something along the lines of being so angry to the point of losing his temper. Now, Calamity Crow was quite concerned about the lack of bread, but he was more concerned about the baker's missing temper. So he decided to go help the baker find it. Yes, find the missing temper. He searched everywhere, in and out of bushes, down the small streets, in the playground, earnestly looking for the baker's temper. But it was so difficult to find because Calamity Crow didn't know what a temper looked like. Add to that the fact that no one was willing to help him! As soon as he mentioned what he was looking for, people just started giggling. But that didn't stop him. He just kept on looking. I cannot remember how the story panned out, but it made me quite ashamed. Reason is that just a few days ago, I lost my temper as well. With a longtime friend. To clarify, I do think that the reason for my irritation was well deserved. I felt the friend was being overly critical, and his criticism came from a sense of superiority as opposed to genuinely wanting to help. I also felt the friend was falling into the trap of holding a lot of people to high standards but making exceptions for select people, himself included. But then, I overdid it. And as all things 'overdone' goes, said too much, too fast, too deep. Question 1) Is what I am about to say true? Do not exaggerate, or add subjective assessment. And for the goodness sake, do not make things up. Question 2) Is what I am about to say edifying/ Will it be helpful? Even if it is the dreaded phrase 'feedback' which people sometimes think they are entitled to give, irrespective of their own shortcomings, will it help the person improve, or will it degenerate into a shout fest? Question 3) Is it possible to say it in a loving way? Even if you scale the first two questions with a resounding YES, the way we say something is just as important as what we want to say. The choice of words is so critical, so that we do not unnecessary hurt people, especially those we love. I did a mental check of my last tempestuous episode, and I think I failed partially on point 2 and woefully on point 3. As we navigate this journey of life, I guess it is crystal clear. People will always annoy you. People will always criticize you. Sometimes with good intentions, sometimes because they are just arrogant punks who have no other means of showcasing their misguided 'superiority' (or should I say inferiority) than to run others down. But in the end, the most important thing is that you remain rational, and not lose your temper. Because things said can never be taken back. And if that is not enough reason for you to remain calm, please remember Calamity Crow, and think about the poor bird running around your city, looking for your temper. Nice one as usual E! Not a bad idea letting someone knowing just how annoying they may be especially with the character of this your close friend like your clearly explained. Well, you've given this friend a clear signal. Don't complain too much when you know you can't proffer a solution. Good lesson for your friend, though such people can't be changed but they could learn and be careful to make judgment whenever they're around you. You can always tell a good friend the truth no matter how painful it may seem. I love your courage and the principles you stand for. God bless you always.